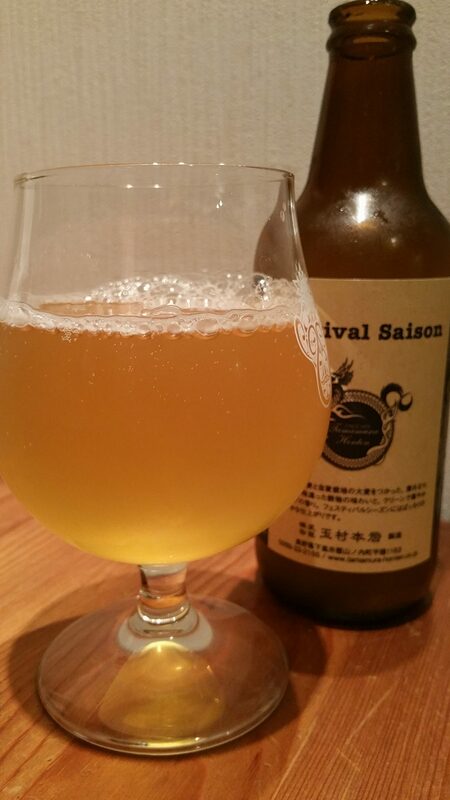 Shiga Kogen Festival Saison is a 6% saison from Tamamura Honten, based in Nozawa Onsen, in Nagano, Japan. It’s part of their limited edition summer line up and can be found in both bottles and on tap. The 2018 version of Shiga Kogen Festival Saison was brewed using Bru-1 hops – an experimental hop from the USA. Shiga Kogen Festival Saison poured out a slight hazy light orange yellow colour with a bare minimum amount of head on top. It was so brief that those bubbles you see above disappeared after the picture was taken. There was a subtle yeasty funk coming off Shiga Kogen Festival Saison, along with some herbal earthy tones too. A peculiar aroma for a Shiga Kogen beer – I was kind of expecting something lemony or tropical based on their past beers. Even though Shiga Kogen Festival Saison is a saison – which are pretty hard to find in Japan – it had a distinct bitter kick to the body. The earthy body followed up with your typical Belgian funk to the saison and at 6%, some alcohol heat was detectable along with a slightly sweet bready body. Shiga Kogen Festival Saison also had an underlying sour note to it that lasted throughout drinking – maybe deliberate as it wasn’t off-putting – but it’s there. After the Shiga Kogen Miyama Blonde and Shiga Kogen Indian Summer Saison, I was hoping for better. A shame really.